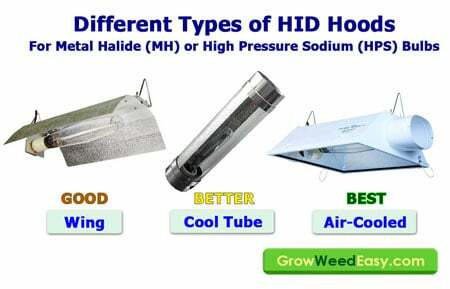 Get the Right MH/HPS Grow Light! So you’re ready to get a MH/HPS grow light? Perhaps you want to upgrade to an MH/HPS light from your existing setup, or maybe this could be your very first grow light for growing cannabis. MH/HPS is a great choice for growing cannabis! This type of grow light has been the “golden standard” of indoor growing for decades because they work so well at delivering fast growth, big yields and dense, potent buds! They are easy to use and there’s an abundance of information, guidance and other types of help for MH/HPS growers. 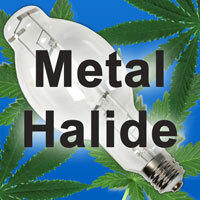 MH stands for “Metal Halide” and HPS stands for “High Pressure Sodium.” These are two specialized types of bulbs that are great for growing plants, from a class of lights known as HID (High Intensity Discharge). MH lights appear blue and are often used in the cannabis plant’s vegetative stage (first stage of life). 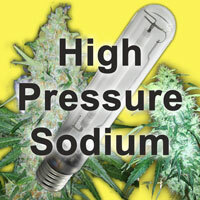 HPS lights appear yellow and are often used for the flowering stage (second stage of life). Either type of bulb can be used for the entire cannabis plant’s life span, but HPS bulbs are better for the flowering stage. Many grow light ballasts allow you to use both MH and HPS in the same hood/reflector – just take one bulb out and plug in the other bulb – you’re good to go! These lights are bright! While MH bulbs give off blue light, HPS bulbs like this one give off bright yellow light, which happens to be perfect to get plants to grow buds during the flowering stage. Notes: Nearly all 150W MH/HPS have a “Built-In Ballast,” which means everything is actually attached together and you just plug the light directly into the wall. A 150W does not get very hot compared to all other HID grow lights, and many growers may not need any kind of exhaust system with a 150W. Notes: Some (but not all) 250W MH/HPS have a “Built-In Ballast,” which means everything is actually attached together and you just plug the light directly into the wall. Some 250W HPS lights have a traditional ballast, which means that the ballast is a separate piece from the hood/reflector. In general, it’s better to get a light where the reflector is separate from the ballast – they are more efficient, cooler, and spread their light over a bigger area. 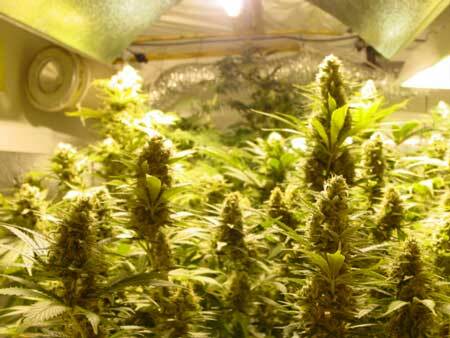 Notes: 400W is one of the two most popular sizes for small-scale growers (along with 600W). A 400W grow light runs relatively cool compared to most other HID lights, but packs quite a punch when it comes to yields. 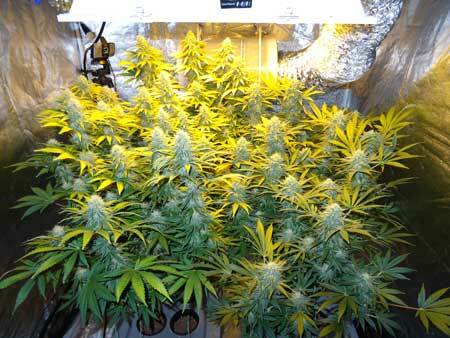 Generally it’s a good idea to set up an exhaust for a 400W grow light to manage temperatures. Notes: 600W is one of the most popular sizes for small-scale growers (along with 400W). A 600W grow light is the most efficient of all HID lights, which means it produces the most amount of light per watt of electricity. To prevent heat problems, I would not recommend getting a 600W light for a regular grow room without installing an exhaust setup or some other way to control temperature. Coverage Area: 4′ x 4′ (1.2m x 1.2m) up to 5′ x 5′ (1.5m x 1.5m). Note: 1000W is the biggest standard HID grow light size. A 1000W grow light is extremely powerful but can also get very hot. To prevent heat problems (which can adversely affect your plants), it is important to set up an exhaust setup or some other way to control temperature. Specialty grow lights like MH/HPS grow lights can be found online as well as in person at hydroponic shops and some gardening stores. Below I will share complete shopping lists I’ve put together in order to help new growers get started with everything they need! When getting an MH/HPS grow light, you need to choose whether you want to get an “All-In-One” kit which has all the individual parts packaged together, or whether you’d like to get the 3 pieces separately. Getting the pieces separately is easy and will save you money, plus you’ll end up with higher end equipment. There’s no special tools or assembly acquired – everything connects easily togethe. It’s as simple as screwing your bulb into your hood/reflector then plugging in your ballast. The most important thing to remember is that the bulb(s) and ballast should match each other. So for example if you get a 400W ballast, it MUST be matched with a 400W bulb. However, any reflector or hood will work with any bulb or ballast, though some are better than others. This gives you the most flexibility as you can use either type of bulb, and digitally control how intense you want the light to be at any moment. Cheap ballasts work great (I’ve grown with several! ), but more expensive ballasts last longer and some of them put out more light for the same amount of electricity. It’s always a good idea to get the best equipment you can afford, but even the most entry-level equipment will get you all the way to harvest with great results! What is the difference between a “digital” and “magnetic” ballast? Digital ballasts cost a bit more than a magnetic ballast, yet have big advantages. A digital ballast runs cooler, uses less electricity and produces a higher light intensity. If you like taking pictures of your plants, a magnetic ballast will make dark lines all over your photos. In addition to no lines in pics, digital ballasts are compatible with more types of bulbs, while a magnetic ballast needs special magnetic ballast compatible bulbs and will burn out the wrong type of bulb. What is a “dimmable” ballast? A dimmable ballast allows the grower to adjust the ballast to put out less light (and use less electricity) when plants are small and don’t need full-strength light yet. This can shave quite a bit off your electricity bill and make it easier to nurture young plants. It can also be helpful to turn lights down during a heat wave. If you get a dimmable ballast, make sure your bulb can also be dimmable. Can a ballast support both MH and HPS bulbs? Some ballasts only support one type of bulb, while others are compatible with both types of bulbs. For most new growers, I recommend getting a ballast that supports both MH and HPS bulbs so you can interchange them easily between the vegetative and flowering stage. It is possible to grow a cannabis plant from seed to harvest on either just MH or just HPS. If you’re going to choose just one, I recommend getting HPS since it’s more efficient (puts out more light for the amount of electricity used) and will get bigger harvests in the flowering/budding phase. But it is also possible to grow from seed to harvest with just an MH bulb, as long as you don’t mind smaller buds. Every ballast will clearly state what types of bulbs it supports, so no guesswork needed. Never buy used bulbs! MH and HPS bulbs lose efficiency the longer they’re used. Turning bulbs on and off frequently will also wear them out. A bulb that has been used for a few grows will put out significantly less light than a new bulb. Because of this, it’s recommended that growers replace their bulbs with a new one every 3-4 grows and avoid ever buying a used bulb. Some sellers will actually replace burnt out bulbs within a certain time period, so definitely take advantage of new bulbs with guarantees if you can! What does “digital” or “magnetic” mean when it comes to HID bulbs? Make sure that if you have a “magnetic” ballast that you match with a bulb that is compatible with magnetic ballasts. A digital ballast can support both types of bulbs. Some companies use the term “Deluxe” to describe some of their higher end bulbs. Deluxe bulbs are generally considered to be “spectrally enhanced” which means they provide a little bit more usable light to your plants for the same amount of electricity. They are meant to enhance growth without using more energy, and they tend to cost quite a bit more. Some manufacturers claim their Deluxe bulbs are 10% brighter than their non-Deluxe counterparts. What is the difference between wing, cooltube and air-cooled hoods? Read the full tutorial on hoods and reflectors. Wings are basically just a reflector with a built in spot for the bulb to connect. Wings don’t have any built-in cooling options and can tend to cause hot spots on the tops of the plants. Wings are usually the cheapest option and often have shoddy construction. Plus the edges can be sharp, not something you want at face level! Cool tubes are built so that the bulb is contained in a tube. They are meant to be hooked up to an exhaust (via ducting) to pull all the heat away. Cool tubes are less likely to cause hot spots on the plants than wings, and can fit in smaller spaces than any other type of hood, but they tend to be limited at reflecting light. Usually there is only a small reflector built into the top of the tube, though some have a small reflector. They do a pretty good job at reflecting light, but wider hoods tend to be more effective. Air-cooled hoods are great for capturing hot air and keeping them away from the plants. They are also able to be hooked up to an exhaust system. One of the advantages of air-cooled hoods when growing cannabis is they have a big, smooth reflecting surface to reflect a great deal of light down at the plants (without also sending heat down at the plants). This allows the plants to get more light from the same bulb. XXL hoods are designed to be wider so that they reflect light over a bigger area with the same grow light bulb. Which hood/reflector is best for my MH/HPS grow light?